A filmmaking couple from the Quad Cities is planning for the Davenport debut of their newest movie later this month. Kelly Rundle says he and his wife, Tammy, of Fourth Wall Films, are ready to premiere “Sons & Daughters of Thunder,” on what will be the 185th anniversary of what’s known as the Lane Seminary Debates, a turning point in American history. Years later, Stowes’ novel “Uncle Tom’s Cabin” is said to have been described by President Abraham Lincoln as the book that started the Civil War. 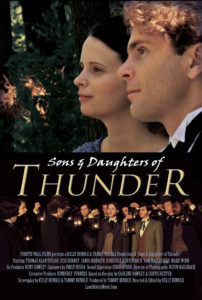 The Rundles’ film is based on a play written by Curtis Heeter and Earlene Hawley of Waverly, Iowa. The film features actors from Los Angeles, Chicago and the Quad Cities. Most of the filming was done in and around the Quad Cities in historic homes, churches and other buildings. Some scenes were also shot in Cincinnati in the Harriet Beecher Stowe House — the last remaining structure on what was the Lane Seminary grounds. The film is scheduled to premiere at the National Geographic Giant Screen Theater at the Putnam Museum in Davenport on March 16th. Another screening of the film is planned for March 23rd at the Garfield Theater in Cincinnati, Ohio, where the true story took place.